When we built our house we knew that the space down one side would make a terrific cat enclosure. 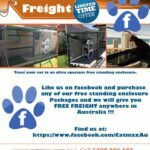 I had recommended Catmax to a friend, so knew how good their enclosures were. 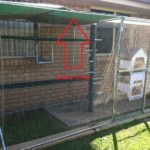 With a fence at the front and a gate at the back, we had Catmax enclose the rest with ‘Clearnet’. Then it was time to adopt two cats! Billy & BJ were surrendered to the Cat Protection Society as 3 year olds. They came from the same household, so it was an easy decision to adopt both and keep them together. These photos were taken on their first day at their new ‘furever home’. They can access their enclosure 24 hours a day through a cat door in the laundry. Three years later, they still enjoy their outside space and I am very happy knowing they are always safe.